Tech Digital Seva: Like every other competitor JioPhone also got its competitor now in market. Recently Airtel has launched new 4G LTE support mobiles in market. As days pass on the new inventions will begin and new updates will roll out, market competitors are immensely offering price of Rs. 0/- or more precisely of free. So, countermeasures from the rival companies are necessary. India’s first telecom company RIL’s JioPhone got its competitor Airtel. Airtel has joined their hands with homemade brand Karbonn to make the lowest price range, which features 4G LTE support. 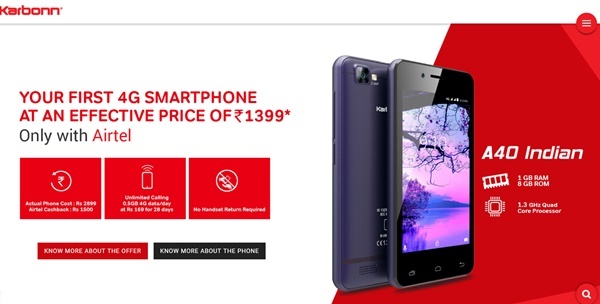 As per the source information Airtel Karbonn A40 priced at Rs. 1,399/-, the partnership will continue with the phone and would launch as “Airtel’s Mera Pehla 4G smartphone” slogan. 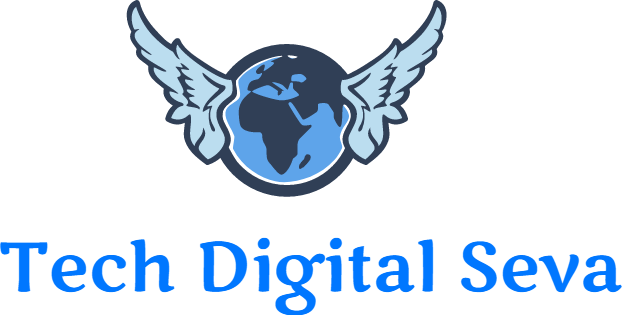 The method of providing the lowest priced 4G LTE mobile, where every common man can utilize the 4G technology. Also Check: JioPhone Online Booking, 6 Billion Delivery Jio Phones. As we have seen the JioPhone 4G are already available in market with the lowest price range, while no other mobile company is providing 4G device at this price range. Now Airtel Karbonn A40 has taken the lead and proving the customers 4G handsets priced at Rs. 1399/-. Customers need to know that Airtel Karbonn A40 will come contract based phone, so you need to choose a plan from the native telecom operator to avail the phone features. Airtel is looking to charge around Rs. 7000/- from each customer for a hole period of 3 years to use its services. While JioPhone can be returned at any time in order to claim their amount, in this case airtel has announced the customers can return the phone end of the time period without giving back the phone. Looks like JioPhone has a good competitor in the mobile market, as we have seen that around 6 million of JioPhone are getting delivered by end of the festive season. 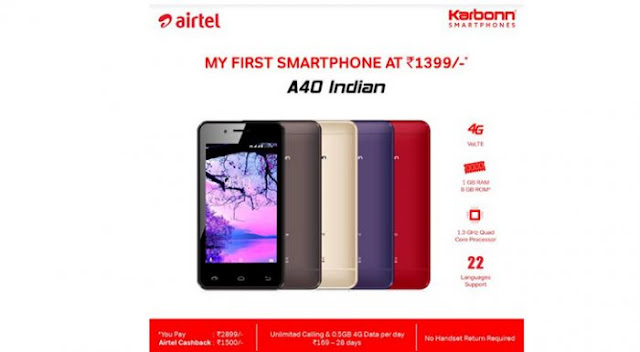 Now Airtel also pushing its Karbonn A40 phones in market very soon. However, we know that JioPhone inbuilt comes with contract-based, as the phone will work only with Jio sim. On other hand Airtel Karbonn A40 will not come with locked, customer can use any of the service operator. Also, Karbonn 4G LTE is fully featured mobile which got Full scale of 4G VoLTE support and also airtel in migrating their services from 4G to complete 4G VoLTE features. That would be hard for jio company to get back their customers. Main aspect of JioPhone is that it’s completely featured 4GLTE support mobile phone. Coming to Airtel Karbonn A40 is completely smartphone first in India. As JioPhone first phase was made in china and got branded in India. Whereas, Airtel Karbonn A40 purely made in India, in support to MoDi Digital India. As we confirmed you that JioPhone cash back offer’s only when customer handovers their phone, he is liable to get amount back. Whereas, Airtel Karbonn A40 will pay back total amount without losing your mobile, customers need not return their mobile phones in order to claim money. As need to ensure which will be more beneficial for our daily usage. As we know the Karbonn company has a good will in Indian market, combining both airtel network and Karbonn mobiles, will make their efforts in to success track. 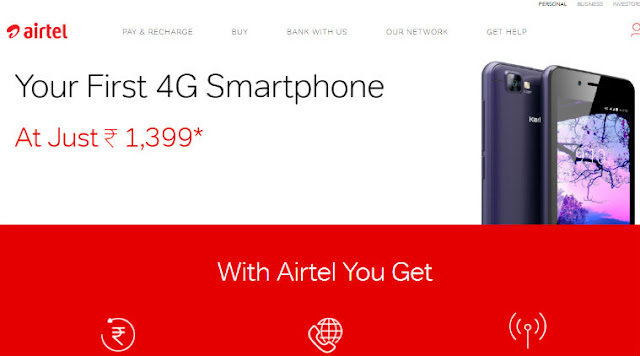 Soon Airtel Karbonn A40 online booking with start check here.